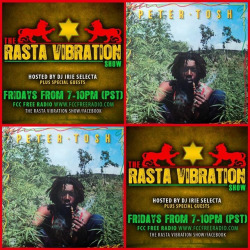 The Rasta Vibration Show is in full effect tonight! We will be talking to Damas Reup about his up coming EP, New music and up coming tour dates. We will also have a tribute to the great ~Prince Jazzbo~ and a bunch of new music!!!! Tune inn world wide 7-10pm(pst) on www.fccfreeradio.com Studio 1A! If you have a smart device you can catch us on the tune in app…… Big up!!! !